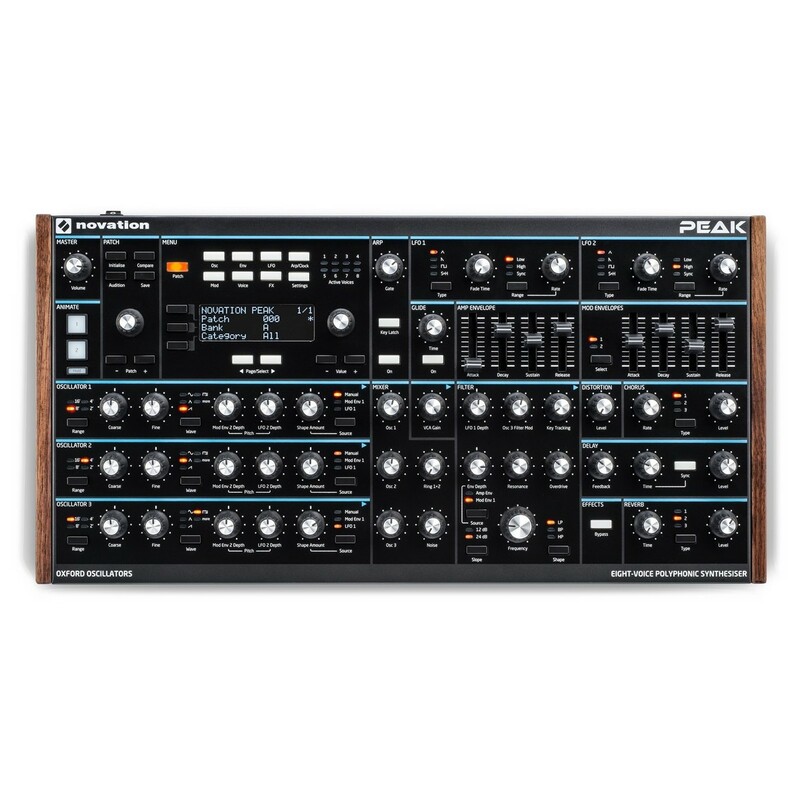 The Novation Peak is a desktop polyphonic synthesizer featuring eight-voices and three New Oxford Oscillators for each voice. The innovative New Oxford Oscillators use two waveform generating techniques, NCOs (Numerically-Controlled Oscillators) and 17 digital wavetables, allowing you to create a diverse palette of sounds. 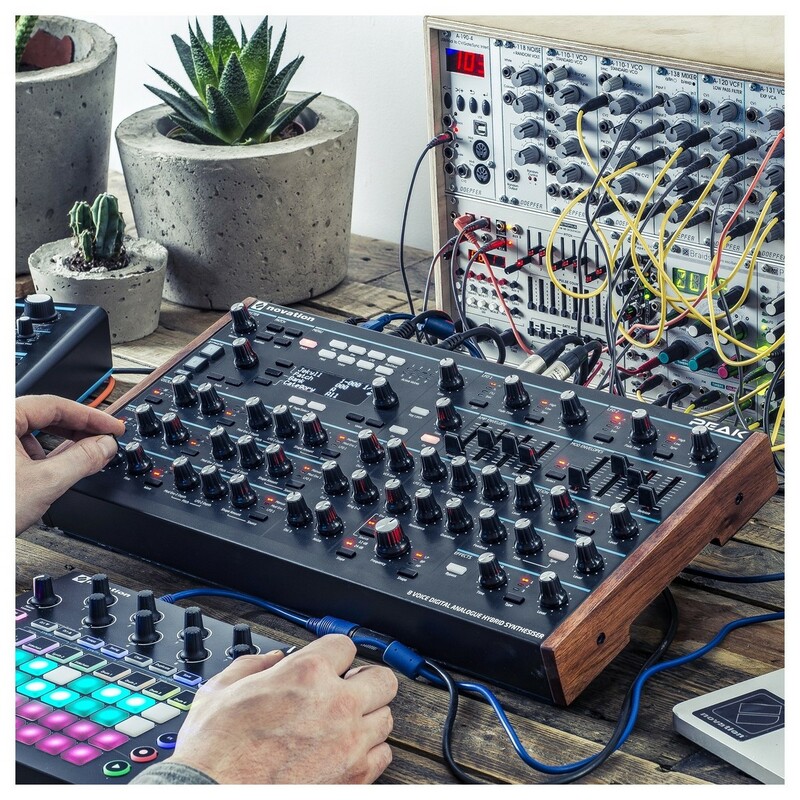 The flexible design of the Novation Peak features a resonant multi-mode analog filter for each voice as well as three distortion points per voice. The modulation system features a 16-slot modulation matrix configuration and 16 direct assignments in the main controls, ideal for intuitive patch design and sound editing. The Novation Peak also boasts a CV modulation input, MIDI I/O and a USB connection for using the Peak Synth with other devices. 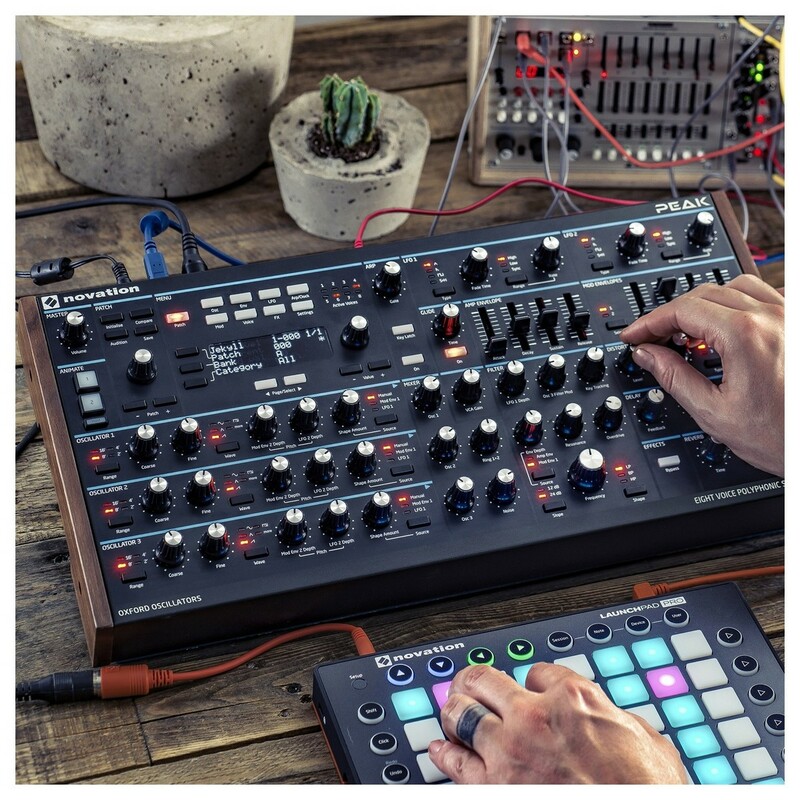 The Novation Peak is a digital hybrid, desktop poly synthesizer featuring eight-voices and three New Oxford Oscillators for each voice. The New Oxford Oscillators capture the essence of analog sound thanks to the premium-grade NCOs (Numerically-Controlled Oscillators), while providing the flexibility of the digital domain with 17 digital wavetables. The highly versatile oscillators and wide selection of wavetables allow you to create a diverse palette of sounds, while retaining that classic analog grit and warmth. The eight-voices allow you to trigger chords, blend notes and sounds together and more, for flexible sound design options. 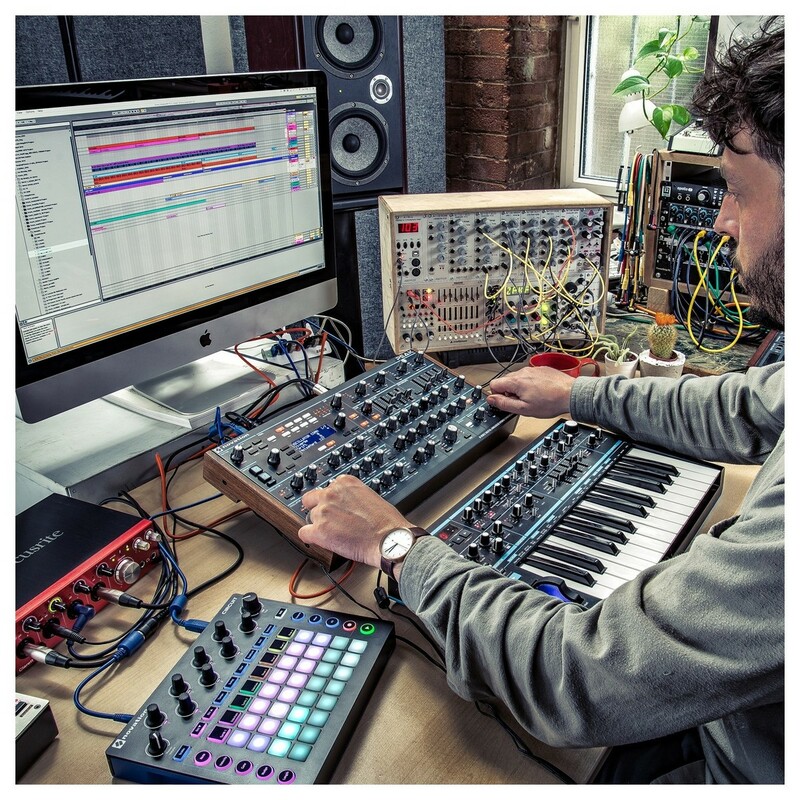 Each voice on the Novation Peak features a resonant multi-mode analog filter for each voice, as well as three distortion points for each voice, including: pre-filter, post-filter and global. The Peak Polysynth is capable of receiving polyphonic aftertouch, providing expression control, right at your fingertips. Premium-grade effects are at your disposal to add character and flare to your sounds, including: Chorus, Reverb, Delay and even an on-board arpeggiator. The ergonomic, 16-slot modulation matrix includes 16 direct assignments in the main controls, ideal for patch design and sound editing. The modulation matrix is cleverly arranged to get the most out of your synth, including three ADRS envelopes as well as two LFOs per voice, allowing you to create more complex movements. Two animated buttons are perfect for live performers, giving you instant one-touch transformation of patches. The compact and highly portable design of the Novation Peak, makes it ideal for both live and studio applications alike. Combining the extensive modulation system with its high-quality integrated oscillators opens up a whole new world of sound design techniques. The Novation Peak Synthesizer features a diverse range of digital and analog connectivity including a CV modulation input for integrating with other modular systems. 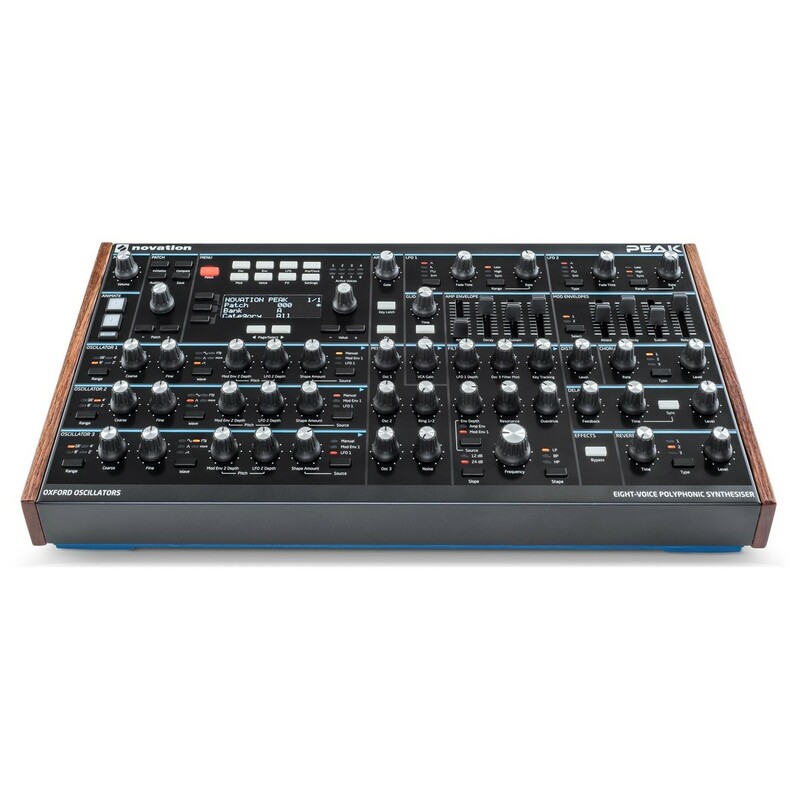 In addition, the Peak also features MIDI I/O on five-pin DIN ports as well as a USB connection for using the Novation Peak with a Mac or Windows computer. The highly-robust desktop module design is portable and reliable, with an optional die-cast aluminium stand available for increased stability (not included).